So, you said “yes” and are planning a wedding—congratulations! One of the first things couples do when they decide to tie the knot is choose a venue and a date, but after that, they plan their engagement party to celebrate their big news with their friends and family. Unsurprisingly, Valentine’s Day is a popular day to host an engagement party; love is in the air and many people are in the mood to soak it all up! If you’re hosting your engagement party on Valentine’s Day, try out these five ideas to fill your event with joy and love and remember the day for years to come. Whether your partner and you have been together for years and years or only a few months, you’re sure to have some photos together that you adore. Put them on display! Create a decorative display for your photos and let your guests (and you!) enjoy the journey of you and your fiance’s love for each other throughout your relationship. The trip back down memory lane will get the gushy feelings going. If you’re planning your engagement party on Valentine’s Day, we have a sneaking suspicion that you enjoy the holiday, so embrace it as much as possible! Opt for a traditional red, pink and white Valentine’s Day color scheme for your food and decorations. Shower your banquet hall in Northwest Indiana with colorful signs, flowers and table decorations. Plus, this will make it even easier to find adorable decor and small gifts to give your guests as a thank you for sharing the day with you. With Valentine’s Day stuff in stores, you’ll have your pick of the cutest options! Again, take the Valentine’s Day theme in stride with heart shapes. One of the cutest ways to show hearts at your engagement party is through food, like finger sandwiches, and sweets, like brownies, cake or cookies. These heart-shaped foods might almost be too cute to eat, especially if they’re decorated with your and your partner’s initials, names or the date of your engagement or wedding! Ask around to banquet halls in Northwest Indiana if they provide catering services. If they do, see what options they have available to truly personalize your food choices to match the theme. A decorative engagement banner is the ultimate display of you and your partner’s names, your wedding date and any other information you’d love to draw attention to at your engagement party. You can make this banner your own with color, hearts, shapes and designs you love. You’ll want to hold on to this decoration for a while after you get married, so make it something you absolutely adore and match it to your theme! If you’re feeling silly, you can supply your guests with silly costumes or headpieces to wear during the party. Around Valentine’s Day, costume pieces for Cupid, heart-shaped glasses and headwear and other adorable wearable items will be available. Giving your guests the option to get into the Valentine’s Day mood while celebrating can be a lot of fun. Plus, it will make for even cuter photos, especially if you have a photo booth set up! Engagement parties are almost like weddings; you want everything to be perfect and for your friends and family to have a great time. 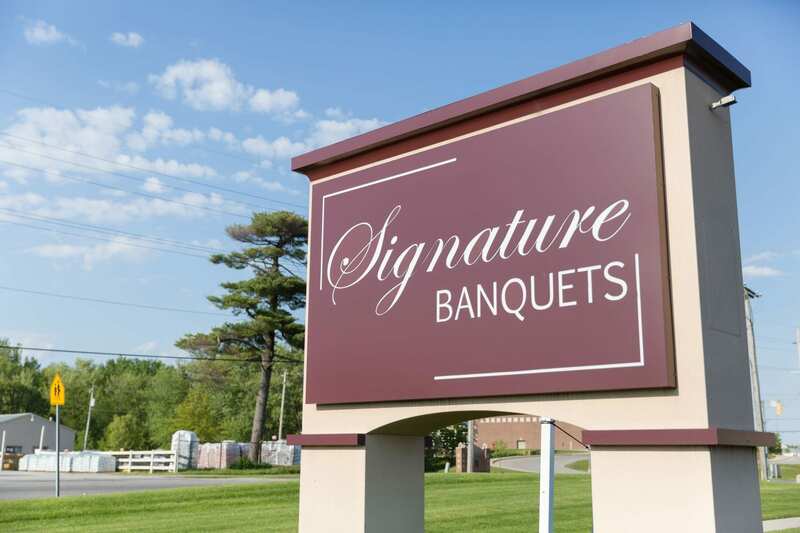 If you’re throwing a Valentine’s Day engagement party and need to rent a banquet hall in Northwest Indiana, contact Signature Banquets. We are a first-class banquet facility with a 9,000 square foot space perfect for your intimate or large event. Our in-house catering services and excellent customer service make party planning a breeze, so call today to make a reservation!